On a recent warm LA Friday night, in the heart of Boyle Heights, loyal fans and supporters of Viento Callejero packed into the MBar to celebrate this up-and-coming band’s much-anticipated CD release party. The celebration was a culmination of a recent crowdfunding effort organized through a Kickstarter campaign in which community contributors, organized primarily through social media platforms, raised over $8,000. The money allowed this trio to showcase their diverse musical backgrounds and talents with the release of an eponymous CD. Composed of three permanent musicians, Gloria Estrada (formerly of La Santa Cecilia) on guitar, Federico Zuniga, Jr. (Grammy-nominated Sistema Bomb) on the bass, and Gabriel Villa (Chicano Batman) on the drums, the trio manages to cover classic Colombian Big Band Cumbias infused with electric psychedelic sounds that give the band it’s unique and novel sound. 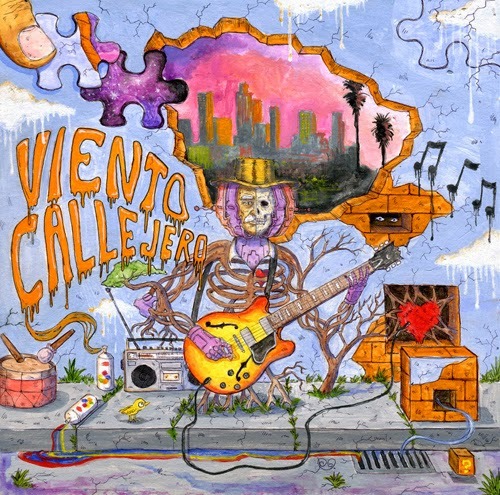 Viento Callejero, as the name implies, intends to uplift and “scoop up” as a wind current might, an itinerant camaraderie among musicians within LA’s impressive Independent Latin music scene. “We scoop up the talents of the ‘callejeros’ and we have honorary ‘callejeros’ all of the time and the name suits how we are. We’re about the party. We’re about hanging out, but it also represents how we are as a band. We wanted to make collaboration more dominant and to be that band that glues talents together,” elaborated Estrada. The variations in singers, musical instrumentation and talents highlighted through the “honorary callejeros” tradition also allows the audience to explore and appreciate featured artists in a new, uninhibited musical setting which lends itself to innovative improvisation on stage. The essence of the novel sounds they imbue classic Colombian big-band tracks with can be found in the song “Cariñito,” available on the new album. “You hear different elements of not just Afro-Colombian cumbias, you hear a little bit of reggae, a little bit of hip hop, rock, funk, the psychedelic… those aspects, where we just thought outside of the box,” Zuniga recounted. Another track on the album, “Tolu,” a 1950s Lucho Bermúdez hallmark song with elements of cumbia, porro, and gaita, opens with the classic big-band version of the famous track and then quickly morphs into Viento’s signature style, riddled with their electric, psychedelic, flare. These musical innovations combined with the voices, creative expression and instruments that have become staples in the LA’s indie Latin scene can be appreciated throughout the composition. From before it inception, Viento Callejero has been adding a slew of new footnotes to this long-vibrant musical community. Estrada grew up in Boyle Heights and found her passion for music at Roosevelt High School. She eventually pursued a music degree at the University of Southern California (USC). Zuñiga Jr., from San Jose, developed his passion through the influences of his musical family and his musical exposure in East San Jose; and Villa, from Colombia, brings his affinity to Afro-Colombian Cumbia and rock. Founded upon their varied musical exposures, Viento Callejero is serious about finding the common elements between numerous musical genres, ranging from classic Veracruz sounds to New Orleans line and brass bands and to traditions birthed in Colombia and Jamaica. They are intent on re-imagining these diverse schools of music through a modern lens. The album cover, featuring the artwork of San Jose-based artist Rodrigo Oliva, uplifts this broad reach in similar way, capturing the wild spirit of invention with vivid, psychedelia-inspired artwork. The piece depicts an Urban Calavera formed from tree branches seated at a curb playing an electric guitar, wearing a sombrero vueltiao, typical of Colombia’s coastal region. Above, the downtown LA skyline is accompanied by two palm trees, numerous other objects commonly found on urban sidewalks and a spray-painted album title. The pictorial iconography found on the cover juxtaposes the organic and coastal next to the electric and urban, representative of the music contained within its sleeves. The cover captures precisely what Viento’s band members intended. “Album covers back in the day presented what the music sounded like. Nowadays, you have music that sits in a magic box in the sky and you can’t touch it or appreciate the artwork as an aspect of the album. We wanted to present that element to the people,” continued Zuñiga, Jr.
You can support our local community artists and musicians by picking up Viento Callejero’s fisrt CD at Espacio 1839, located at 1839 E. 1st Street, Los Angeles, CA or by finding available digital downloads on cdbaby or iTunes.